This is the original Windows XP Professional SP3 (32-bit) ISO from Microsoft. 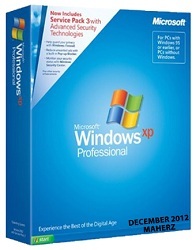 Including Microsoft updates until 19.12.2012, Internet Explorer 8, Adobe Flash Player 11.5 and SATA drivers. * It's the original image from Microsoft except added updates, IE8, Adobe Flash Player (11.5.502.135) and SATA drivers!